The movie tells a story about a young journalist named Ragini. She receives an anonymous information that reveals the secret behind the death of Indian Prime Minister Lal Bahadur Shastri. The ambitious journalist decides to publish the story. And as the result, there sets up a committee of the government to investigate the case. This political drama is based on one of the most controversial events in the history of India, with the modern setting when a journalist digs deeply into the case of Indian Prime Minister’s death back in 1966. After over half a decade, when there has no longer been much concern for the scoop, a journalist, with the power of social media for a sensationalist topic, makes it hot again. She joins in a committee that is in charge of reinvestigate the case and reveal all secrets around it. The film is directed by Vivek Agnihotri, the writer who has witnessed tremendous cases related to politics, rumours and hidden facts about the story. The film reveals to us the political world, which is not familiar with us at all, how complicated it is, and how seriously it may affect people’s lives. Although the story written for this film is good, there are still bad sides about the execution. There is an inconsistency in terms of the film direction and narration. The background music is also too loud and not very suitable for the story. Nonetheless, the casts act very well in this production, with famous stars like Naseeruddin Shah, Mithun Chakraborty, Pallavi Joshi, Pankaj Tripathi, or Mandira Bedi. The characters seem to be too simple for them to show all of their talent, though. 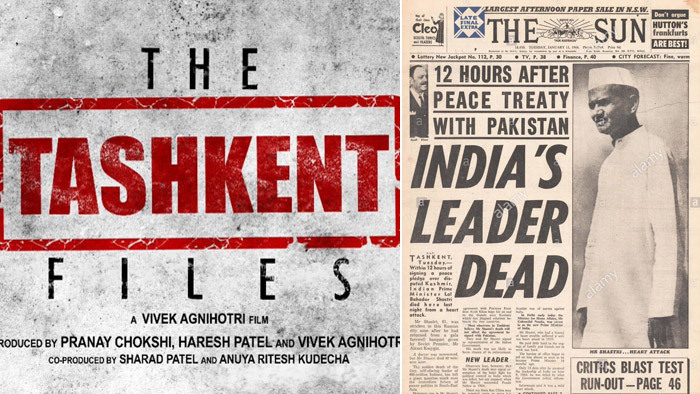 There will be shocking claims to be told in “The Tashkent Files” about the political world in India history. It also highlights some important social issues and includes sensational contents cleverly. It is not a movie that has no drawbacks, but it is a worth-watching film that you can learn a lot from, and be excited with the story telling. With the story revolves around the life of Bollywood stars and royalty, Love Ka Hai Hai Intezaar is a movie that is extremely loved by Indian audiences. Love Ka Hai Hai Intezaar (74 episodes) is a sweet combination between Bollywood stars Sanjeeda Sheikh and Keith Sequeira. Sanjeeda Sheikh first appeared with the role of Nimmo in the TV drama Kayaa Hoga Nimmo Kaa in 2005. She later participated in a number of works such as Kayamath 2007, Kya Dill Mein Hai 2008 especially in 2014 she achieved. It was a great success thanks to the role of Durga Thakur – an aspiring young woman in Ek Hasina Thi. Not only good at acting, Sanjeeda Sheikh also has the ability to dance and dance very skillfully when winning the Nach Baliye 3 competition in 2007. This talent is thoroughly used by her in the movie When the rich lover plays Kamini Mathur – a successful, beautiful Bollywood actor. Maharaja – a prince from a royal family of Rajasthan. He is a standard, stubborn man who lives simply and responsibly. Despite a luxurious life, he still treasures small things in life and human love. He also wanted to find his true love, love himself, not his identity and wealth. Two souls are in tune – Kamini and Maharaja are in love with love and love each other. But fate is irony, Maharaja is married and a daughter named Madhavi. At the same time knowing that truth, Kamini also found himself carrying the drops of Maharaja’s blood. To protect her daughter, her family supports the decision to keep the baby in the abdomen by leaving India to Canada to live. After 20 years, Kamini returned to live in Mumbai with his mother and daughter Mohini. However, Mohini always thought that Kamini was his sister and not his mother. Life is ironic when Mohini gets into a love triangle with Madhavi – a half-sister with her mother. Is that true that Indian movies are just dancing and singing? In the 1970s, the era when Bollywood passed Hollywood in terms of the number of films released was also the coronation period of the film called “chocolate box”, with a nice cover like a box of chocolates, but inside is empty. The script is written according to the formula, the plot is often or stereotyped with many scenes of singing and dancing. The main actors hardly sing with real voices but only sing in a lip-sync style. The directors became hired mercenaries and film-makers, depending on the contract, they even filmed dozens of films in the same year. The 1970s was also the period when India exported films abroad, primarily to serve the needs of overseas Indian communities. From Mauritius to Canada, from the Middle East to the United Kingdom, audiences watch movies in the same style. For the majority of audiences, the first image of Bollywood is the film of the Golden Age of musicals, watching to kill time, watching to relax the mind, but little is left in the mind. In the 1980s and 1990s, there were many criminal detective films, talking about gangs , money controls life, human’s greed, corruption in society became an interesting topic. Besides, Indian cinema still exploits love films for couples, family ties. Indian films became more modern in form and from the 90s onwards marked the coronation of a new generation of actors (Aamir Khan, Salman Khan, Govinda, Nana Patekar, Sunil Shetty, Akshay Kumar, actresses). Sridevi, Madhuri Dixit, Juhi Chawla, Kajol, Manisha Koirala, Urmila Matondkar, Karishma Kapoor …). Among them, the most famous Indian silver screen star is the Shahrukh Khan idol, whose name has been established since 1992. These names follow steps like seniors and sisters like Rajesh Khanna, Dharmendra (1960), and Amitabh Bachchan, Mithun Chakraborty, Anil Kapoor, Hema Malini, Jaya Bachchan, Rekha (1970-1980) to conquer foreign audiences. The number of Indian films won at international film festivals such as Cannes, Berlin, Venise or Toronto are not many. Meanwhile, movies from Iran, Japan, South Korea, Hong Kong, and China often appear on festivals or at international film awards. More than 100 years after the launch of the first Indian film, Indian cinema is still on the way to find a shining opportunity to win a good position in viewers’ eyes. The film takes place in modern Indian society with three elements of money, fame and English playing an important role in assessing and recognizing someone. The main character of English Vinglish is Shashi – a typical traditional Indian woman. She has no high schooling, day and day stays at home making cakes, cooking and taking care of her husband and children. Shashi’s weak at English and is always ridiculed by the whole family, from her husband to two children. The turning point came when her sister in America invited the whole family to attend the wedding ceremony of her niece. When Shashi first stepped out of India, Shashi was startled when he came to New York. She decided to attend a short-term English training class in the United States to be able to communicate with people here and most of all, seek respect. Through many awkward and humorous situations, Shashi gradually overcomes her shyness and becomes a confident, courageous woman with more liberal thoughts than before. English Vinglish is quite similar to the film that won the Oscar for Best Picture of 2011 – The King’s Speech. Along with the story of the disabled people in communication, the film of Indian cinema is more humorous and fresh than British one. The situation in the film is quite simple, just a traditional Indian woman wants to learn English to seek acceptance and respect, but the filmmakers know how to put in elements of very unique cultural conflict in the movie. English Vinglish marks the return of Sridevi – one of the greatest actresses of Hindi cinema – after a decade of absence. Nearly 50 years old, but her face is still attractive with delicate features that fascinate viewers. Sridevi’s acting is also completely convincing and hypnotizes the audience to follow each of Shashi’s emotions in the inner conflict. Music is also an attractive highlight in English Vinglish with modern, busy songs, especially the song that appears in the middle of the film is very interesting and impressive. Looking at the name of the movie, you will probably imagine some part of the content of the Rat’s Millionaires. It tells the story of a young man from Juhu slum in Mumbai. Once, he participated in the Who will be a Millionaire TV game and correctly answered all the questions that surprised the whole audiences and the organizers, the officers suspected he had used tricks or cheating. However, no one knows that, the answer he gives is a memorable experience in his miserable childhood. Haider is the third part of the Shakespearean trilogy of works after Maqbool (2003) and Omkara (2006). The film impresses by the perfect, sophisticated and unique combination of Indian filmmaking style and the British play in water. Haider is a film about politics – crime was launched in 2013. The film is considered a “modern version” of the classic Hamlet play (William Shakespeare). Haider was a poet, he returned to Kashmir at the height of the conflict (in 1995) to find answers about his father’s disappearance and was eventually dragged into the state’s political spiral. India has always been looking down on women and English Vinglish has affirmed the position of women in modern society. The film revolves around the character Sashi who is often looked down upon by her husband and children because she stays at home as a housewife all day. She came to the English class and only in her class that everyone was treated equally. Although she is too old to go to class, it is Sashi’s everyday joy. In addition to humorous and touching sence, the film also contains deep humanistic values ​​about the fate of women in society when despised. This is a film directed by Aamir Khan and also the main actor, produced by Aamir Khan Production. This is a great film on the topic of educating young children, not only meaningful for parents and teachers, but even the generation of teenagers can find themselves when watching it. Ishaan, an 8-year-old boy with a poor academic record, was sent to a boarding school by his parents, where he was found to have dyslexia. In that place, he was filled with fear and guilt, was looked down on by teachers and friends, who considered him useless, unable to learn anything, but no one knew deep inside him was a world full of colors. Until the drawing teacher Nikumbh (Aamir Khan) moves to teach his class and discover the gift of his inner talent. From making friends with Ishaan, respecting, listening, learning and sharing like two friends, Nikumbh helped the boy overcome difficulties in reading, step by step bringing him to the outside world. For the first time in her life, Ishaan felt like he was appreciated and evaluated fairly. By the end of the year, Nikumbh organized an art creation competition for all teachers and students in the school, the contest was judged by a famous artist invited to school. Nikumbh knows that this will be an opportunity for Ishaan to show off her talents, let people see and recognize the innate ability of the boy, and that will help him be more confident. Prominent with his creative style, Ishaan won an absolute victory, Nikumbh was runner-up with a painting of Ishaan boy with sparkling eyes, bright innocent smile, passionate fiery red hair . When Ishaan’s parents came to the school on the closing day, meeting Nikumbh and the boy’s harsh father could only say a word to thank Nikumbh from bottom of heart. With deep human values, gentle storyline that touched by the perfect acting of the two main actors. The film shocked many parents to realize their selfishness in educating their children. Director Ketan Mehta spent two years completing Bollywood film named “Mangal Pandey: The Rising”, and was joined by Prince Charles. This movie brought them back 150 thousands pounds from the British Film Council, set a new record of revenue with about $ 5 million in ticket sales during the first week of screening across India. It is featured the India in 1857 rebellion of Hindu and Muslim soldiers, led by leader Mangal Pandey opposed to the British East India company lubricating bullets by the oill animals that the religion had not allowed to do so. This rebellion against British caused many British soldiers to die at that time. Although Danny Boyle is a British director who sits in an important seat, “Slumdog Millionaire” is rich in colors of beautiful India. The bright and dark parts of Indian society suddenly opened in front of the audiences, allowing us to witness aspects of the lives of the lower classes and the poor in India. Slumdog Millionaire tells the story of a young man Jamal (Dev Patel) from the Juhu slum in Mumbai when he participated in the “Who Wants to Be a Millionaire?” Television game (Hindi: Kaun Banega Crorepati, the game is similar to Who want to be a millionair) and answers all questions correctly, surpassing everyone’s expectations and causing the host and police officers to be suspicious. However, they did not know that behind each answer was memorable experiences in his childhood. “Teri Meri Kahaani” will bring the audience into an immortal love that goes through three beautiful lives in 1910, 1960, and 2012. Despite the harsh challenges of their love, we thought that their love is shattered by their turbulent life, but two hearts still belong to each other and they still sacrifice for each other. All of those three India films above are very good and earn high rating. You should try watching them whenever you have a chance.